You are viewing the 2017 barbecues ratings page. To view the current barbecues ratings page follow this link. 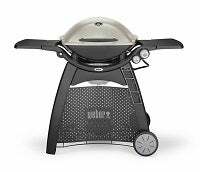 Canstar Blue reviews barbecues from Weber, Gasmate, Jumbuck, Matador, BeefEater & Beefmaster, based on factors such as cooking performance, reliability, design, value for money, ease of cleaning, extra features, ease of use and overall satisfaction in 2017. Canstar Blue research finalised in August 2017, published in September 2017. In our inaugural barbecue ratings, popular brand Weber has taken out top spot, dominating most categories, including top marks for overall satisfaction. One of the great things about summer is being able to enjoy eating outdoors in the fresh air in your backyard or on your balcony. It’s even better when you can take the cooking outside, too. Barbecuing is a classic Aussie summer pastime for a reason. With barbecue-ready weather almost year round – well, depending on where you live – it’s only natural that we take the opportunity to get our grill on rather than staying cooped up indoors in the heat. But which BBQs are best at the job? 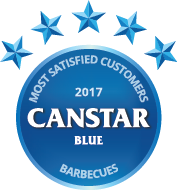 To offer some guidance, Canstar Blue has surveyed hundreds of Australian households that have recently purchased and used a new barbecue, with their feedback reflected by the star ratings you see above. Weber proved a cut above the rest, rated five stars in all key areas, including cooking performance, reliability and ease of use. It also scored top marks for design and ease of cleaning, while scoring four stars on value for money and three stars in terms of extra features. It was four stars overall for Gasmate, Jumbuck and Matador, with three stars going to BeefEater and Beefmaster. We’ll look at some of things you need to consider before buying a new BBQ shortly, but let’s first take a close look at each brand in our ratings, to help you decide which might be best for you. The following six brands all achieved the minimum sample size to be included in our 2017 BBQ review. Keep in mind that there are many other brands out there, but looking at these brands first may be a good starting point. Weber produces three main categories of BBQ – charcoal, premium gas and the famed Weber Q range. The charcoal range boasts authentic coal grilling for that unique smoky flavour, and if ashes were a concern, these beauties come with a cleaning system to make the after-cooking clean-up easier. The Premium Gas range is your more traditional ‘barbie’, with the Summit series dubbed the ‘holy grail of BBQs’. Some models are built-in boasting up to six burners. The Weber Q is arguably the most popular series, suitable for small-time grilling, with many grills able to be placed in the dishwasher for easy cleaning. 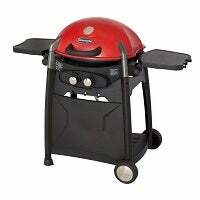 Prices for the top-range Weber Summit series cost in excess of $5,000, while Weber Qs start at around $300. The brand was a stellar performer in our ratings, rated five stars for overall satisfaction plus top marks for most other research categories. Gasmate splits its BBQs into two key categories – outdoor living and camping BBQs. Gasmate outdoor living barbecues range from the compact ‘Odyssey’ range, to the full-blown outdoor kitchen units available for purchase. Traditional barbecues are also on offer, with most being powered by gas. The Odyssey range represents a convenient and portable grilling option. The outdoor kitchen range is the ‘bees knees’ when it comes to outdoor cooking, and would be suitable for a comprehensive outdoor setting for the modern home. Camping barbecues are also on offer, which usually feature only one burner. Traditional Gasmate barbecues are available from around $600, while portable barbecues are cheaper. Built-in, outdoor kitchen barbecues start at about $3,000 but require professional installation. Gasmate was rated four stars overall in our review, but did get top marks for ease of cleaning and ease of use. Jumbuck’s range mainly focuses on barbecues with at least two burners, though some come with up to six. All in the range is a series of portable, kettle and charcoal barbecues that start at around $60. Flat top BBQs come with at least two burners, and come with basic designs, many with hoods to promote roasting. For the more serious grill enthusiasts, six burner BBQs are on offer, starting from about $1,000. Jumbuck was one of the cheaper brands to be featured in our ratings. But from snags to roasts, Jumbuck’s barbecues are designed to handle it all. Jumbuck was rated four stars overall, but did get top marks on value for money and ease of use. 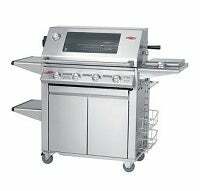 Matador produces a fairly concise range of barbecues, ranging in size from two burners to six burners. They are either standalone or built-in for those outdoor kitchen enthusiasts. Most are gas-powered, which is a popular choice in Australia. Matador is sold exclusively from Bunnings Warehouse hardware stores, making it easy to pop in and get your spanner and walk out with a BBQ. Two burner units start at about $500, while the top-of-the-range six burner units start at closer to $1,000. Matador was rated four stars overall, and was rated three stars on value for money. This may suggest people look for more than just a cheap price when it comes to ‘value’. It did get top marks for extra features as well as ease of use. BeefEater sports a solid range of both mobile and built-in barbecues, most with shiny chrome designs resembling a premium option for your home. In the mobile BBQ range, BeefEater packs in four burners at a minimum, which makes it a strong candidate for cooking, and eating that beef. Most models are gas-powered and feature roasting hoods with an onboard temperature gauge and warming rack. BeefEater mobile barbecues start at about $1,800 for the basic LPG five-burner units, while portable units are available from around $500. Built-in systems start at about $1,400. BeefEater was rated three stars overall in our review, but did get four stars for cooking performance, design, extra features and ease of use. Whether you’re a master chef or not, Beefmaster likely has a barbecue for you. It produces a relatively concise range of both built-in and mobile BBQs, with four burners being the status quo. Most are finished in attractive black and stainless steel designs. All Beefmaster BBQs are gas-powered with LPG as standard, but natural gas conversions are also available. This requires a licensed plumber to install the conversion. Beefmaster mobile barbecues start at about $650, while built-in units start at around $550, which is right in-line with what our research suggests people are spending. Beefmaster was rated three stars for overall satisfaction and every other category in our review. How much do BBQs cost? Aside from cooking some snags and steak, BBQs are often as much of a social statement as they are about cooking food. More than a quarter (28%) of respondents to our survey said they bought a BBQ to impress friends and neighbours. Nearly half said they don’t use their barbecue as much as they thought they would, so that $600-odd price tag could in fact be going to waste. How do I choose the right BBQ? Above all, cooking performance is the most important factor in driving BBQ satisfaction. Ease of cleaning was a surprisingly important factor, and it may not be a factor that people consider – until they need to get their hands dirty! 25% of survey respondents admitted they don’t clean their BBQ after every use. Ick! Below is a list of considerations you may want to run through before purchasing a new BBQ. Portable barbecues are great for camping, beach trips, or those with very limited storage space. Freestanding BBQs can range from the traditional kettle BBQ to a great big heavy-duty grill that takes two strong people to pick up. Some have two or four wheels for manoeuvrability, some just sit on castors, so there’s variable ability to move it around. That means you’re not trapped with your BBQ in just one place if you like being able to change things around, or want to take it with you if you move house. Build-in barbecues are designed to be permanently built into your outdoor entertaining area. They look great, but once it’s installed you can’t move it. The debate over which produces the better flavour – charcoal or gas – has been ongoing ever since both types existed. If you want to be able to grill without getting a smoky flavour, go with gas – 81% of those we surveyed said they cook with gas. Charcoal gives that authentic hot coal roasting experience, but produces ashes that can be a pain to clean up. Gas is faster, more efficient, and easier to control the heat, but has more intricate parts to keep cleaned and maintained. Natural gas means you’ve always got access to fuel supply, while with LPG you need to keep getting the gas bottle refilled. However, not all homes have a natural gas connection and you’ll need a licensed professional to connect it to your barbecue. How many BBQ burners do I need? Consider how much food you’ll want to be barbecuing at once. Another way to think about it is to consider how many people you’ll usually be cooking for. There’s no point in having a massive barbecue just to feed two people. Charcoal barbecues tend to be smaller, except for many of the spit roast designs. This, combined with the fact that charcoal grills need constant monitoring to keep the heat right, means that to feed a big party you’ll be spending most of your time working on the barbecue. 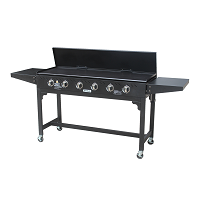 Gas barbecues can have anywhere from 2 to 8 burners. 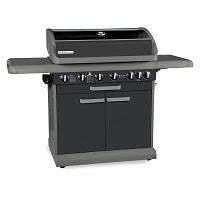 If you’ll usually be cooking for only one to three people, a 2 or 3 burner barbecue should do the job. However, if you’ll be throwing parties or have a large family to feed, 4 or more burners may be necessary to get everything cooked rather than having to cook lots of little batches. A hotplate type barbecue, or a grill with a hotplate section, is good for grilling onions, stir fry, or other food that’s too small to cook on a regular grill. Alternatively, you can just use a pan or other barbecue-suitable cookware on top of the grill if you’ll only need it occasionally. A side burner may also be helpful if you’ll want to cook or heat sauce, soup, or other liquids. Consider how often you’ll need to move the barbecue – if the answer is ‘frequently’, you should test how easily you can move it before making the purchase. Four wheels make it super easy, but lighter and smaller barbecues often have two wheels at one end with a handle at the other to lift and push/pull. Side tables can be super handy for keeping food on hand ready to be put on the barbecue, and move cooked food off the grill. Shelves underneath the barbecue and hooks on the sides make it easier to keep all of your barbecue tools and other bits and pieces together and easily accessible. Two-tiered grills have an extra grill suspended over the main one, usually for keeping food warm or steaming vegetables. A rotisserie either built into the barbecue or a removable one is good for slow-roasting meats and vegetables. A rotisserie is a long metal rod suspended horizontally across the grill, slowly rotated, usually by an electric motor, to roast food. What food can I cook on my BBQ? Despite the Aussie stereotype about shrimp, steak is a popular and easy BBQ choice across backyards and decks across the country. Canstar Blue surveyed 3,000 Australian adults across a range of categories to measure and track customer satisfaction. Data was collected using Qualtrics’ online sample aggregation from ISO accredited panels. The outcomes reported are the results from customers within the survey group who have purchased a new barbecue in the last two years – in this case, 643 people.